Great feature: seats can be removed with ease! I just purchased the vehicle two months ago used. I purchased it based on the fact my girlfriend owned one since 2004 and has 240,000 miles on her car and it is so reliable! And going strong! My car was owned by one owner and had at time of purchase 165,000 miles. She never had anything big to replace. Just the regular maintenance that you do with Honda and oil change/rotate tires, etc.. What really appeals to me is the storage capability. The back seats can be completely removed and stored and you can pack this car full! That sold me right there! In addition, I had been driving for work a Chevy traverse and got use to the bells & whistles especially the cameras to back up and see where you are when parking. The Honda dealership was able to put in my Honda element a new Audio system with the capability of seeing when I back up. In a nutshell, the car just makes me happy when I drive it. The boys that I babysit cannot stop talking about how cool my car is. When sitting in the back it is extremely spacious. I just wish they didn't stop making them. Great for hauling furniture and large items; incredibly durable. I love my Honda Element. I'm a very loyal Honda customer, because they're always well-made and durable. I bought my Element just a few years ago. It had over a hundred thousand miles on it, but it still runs smoothly. The seats can be folded and moved in endless combinations, making my car the go-to in my family whenever someone is moving, or someone bought furniture. It's a sturdy car, and I can't recommend getting a Honda enough. There tends to be an amount of maintenance required but it is very affordable! The Honda element is an amazing and extremely reliable car. The interior is large and comfortable especially for long road trips. The element is the only car I have seen that can make it up any hill when there is snow on the ground due to the four wheel drive. There is no carpet anywhere in the interior so it is always an easy clean up! 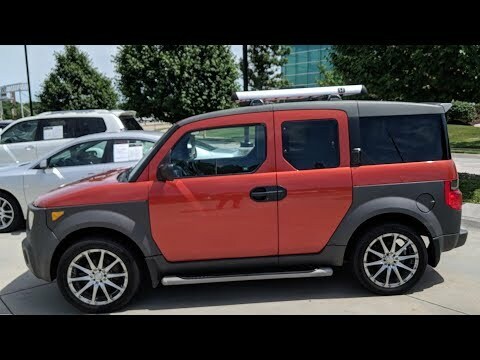 Being in 2018 and having a 2005 Honda element, it is one of the best cars operated. CERTAIN HONDA ACCESSORY TRAILER HARNESS KIT, P/N 08L91-SCV-102, MANUFACTURED BETWEEN NOVEMBER 24 AND DECEMBER 18, 2004, SOLD FOR USE ON MY 2005 HONDA ELEMENT VEHICLES MANUFACTURED BETWEEN DECEMBER 20, 2004, AND APRIL 29, 2005. THE WIRE HARNESS OF THE TRAILER HITCH KIT HAS AN INCORRECTLY WIRED CONNECTOR. AS A RESULT, THE TRAILER BRAKE LAMPS AND TURN SIGNAL LAMPS COULD OPERATE INCORRECTLY, OR A FUSE COULD BLOW CAUSING A SUDDEN LOSS OF BRAKE AND TURN SIGNAL LAMP FUNCTION. IMPROPER SIGNALING OR A LOSS OF TRAILER WARNING LAMP FUNCTION WITHOUT WARNING COULD CAUSE A VEHICLE CRASH, POSSIBLY RESULTING IN INJURIES. HONDA WILL NOTIFY ITS CUSTOMERS AND INSTRUCT THEM TO BRING THEIR VEHICLE TO A HONDA DEALER. THE DEALER WILL CORRECT THE CONNECTOR WIRING FREE OF CHARGE. THE RECALL IS EXPECTED TO BEGIN DURING MAY 2005. OWNERS WHO DO NOT RECEIVE THE FREE REMEDY WITHIN A REASONABLE TIME SHOULD CONTACT HONDA AT 310-783-2000.